The concept of going on an adventure, then writing about it is not a new one. People start by travelling for the sake of exploration, expanding our known world to encompass more. Once this is done the next step is for people who have the need for adventures to go on them, and experience what these newly explored lands have to offer, and sometimes more. A World of Ice and Fire by Linda Antosson, Elio Garcia Jr. and George RR Martin is a compilation of the explorations and stories of the writers and chroniclers in that world by a maester in the Citadel, Maester Yandel. From the explorations done by Lamos Longstrider or by the stories of strange lands and people brought from sailors and other explorers, they adapted the concept of taking was part their known world and went past it. For centuries people have been telling stories about their adventures and experiences. Every once in a while they tend to exaggerate them, making them seem more fantastical and unbelievable than they making it harder for the truth of what these places could be like to actually become truth. During the Middle Ages, the known world can be seen as stretching up to around modern day Ukraine down to past Constantinople to the tip of the African coast, with some knowledge about the happening in the East. It isn’t until the first crusade, when “stories of the strange and monstrous races inhabiting countries beyond the reach of the crusades”1 began arising that we start getting a notion as to what lies beyond what is known to the current world. These stories begin to unleash “a fascination” with the mystical world beyond that send pilgrims with “the fascination of travel”2 off on adventures. These pilgrims then also started to bring back even more stories about these worlds that majority of people had yet to experience. Through the increasing aspect of religion pilgrimage, and traveling for the sake of travel, they became “ a fundamental institution of medieval society” which lead to making “written accounts” of these trips “so interesting to read”3 as they held such wild and imaginative places and people. Just as the known world of the Middle Ages was limited, so is the known world as portrayed in the World of Ice and Fire. 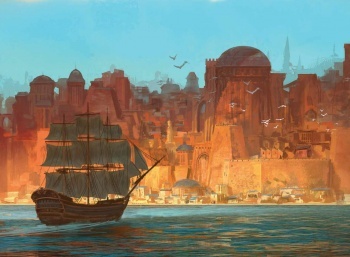 The known world starts with Westeros and Essos, but barely goes past the two as there is “less [known] about the southern reaches of Sothoryos and far Ulthos”4 than Westeros and Essos and even far less about the lands “farther east than the thousand islands”5 as no one has ever been brave to sail that far, and those who do rarely return “due to” the “unknown dangers”6 that lie in the waters. As well, the truly unknown world is that of what lies “beyond the Lonely Light and across the Sunset Sea”7, as no one has yet dared to reach that far in their travels. This creates the question as to whether the stories about these areas can now be taken as proof, or whether they can be taken as a parameter on which to set the truth. Additionally, many of the first stories that people receive about these lands are from sailors, who like the crusaders and pilgrims, brought back the stories from their travels into these distant lands. These stories brought from people who “by nature [are] a gullible and superstitious lot”, who by bringing stories of “ice dragons”, “drowned spirits” that drag down sailors into the deep waters, and “leviathans”8 populating the Shivering Sea surrounding the Thousand Islands can be questioned into the actual legality of their claims. These stories can create the same uncertainty about the world beyond as the stories of “dog-headed creatures” brought “anxiety over the uncertainties of the uncivilized frontier of the Carolingian world”9 when they were first passed along. With the expansion into the unknown, chroniclers and travellers brought back stories of strange lands and even stranger people. A common phrase when referring to the “dangerous and unexplored territories”10 of the world is “here be dragons” which was most commonly used on maps to signify that what lies in that area has yet to be discovered. This same phrase can be applied to the world where actual dragons inhabit it, as each land whether known or unknown, is home to various strange creature and monsters. These monsters vary from the fabled blue-grey giants in the Bone Mountains to the seemingly extinct dragons that can be said to originate from the Shadow Lands to the shadow binders that dare travel to those lands. These can be seen in having origin with the phrase “here be dragons” as they are stories about lands that may be discovered but are still dangerous as the knowledge is limited. As such, medieval writers who wrote about lands they knew little to none about adopted the concept of “here be dragons” and forged it to create stories that would have seemed fascinating and were full of imagination. These distant lands held awe and wonder for the people who lived a regular life, such as the majority of the population of Westeros and Essos who only had stories, not experiences to go on. Although many of these “reports of distant lands”11 brought unanswered questions about who, or what, actually populated them, they also brought out the people who were interested in chronicling them and bringing more reports to the ears of the Europeans. 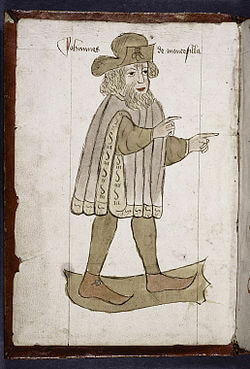 The middle ages had John Mandeville, who was then believed to be a chronicler of his travels, but has been revealed as a pseudonym for a compiler of earlier writer’s works on their travels and the people they met12. Although it, like A World of Ice and Fire is just a compilation it tells us much about his travels across Persia, India and all around the modern day Middle East. During these travels, Mandeville is said to have met Prestor John, a somewhat fabled emperor that ruled over an amazing land and was said to be a great Christian king. He wrote about this great emperors origins, his lands, and the happenings of his court, such as an interviewer would write about their interviewee. Although the origins of the story have never been fully discovered, it shows how the writer at the time took the idea of this land to the east that no one really knew about and twisted it to include this great man that would awe the readers. A similar crossover for the world of the Westerosi was Lamos Longstrider, who was a scribe that travelled all around the known world and wrote about the people he interacted with and the things he had seen. Lamos Longstrider did a similar thing to Mandeville, wandering the globe and writing about all those that he encountered and the wonders he witnessed. He, like Mandeville, went around interviewing and writing down facts about these people. He wrote down what they told him, and also put in his perceptions of the people he visited, such as the woman of Kayakayanaya who he claimed that there were “no fiercer fighters on all the earth”13. Longstrider was one of the most well-known traveller of the known world, as he is referenced many a time in A World of Ice and Fire and as such can be seen as the greatest that had lived prior to the life of Maester Yandel. The only other such people that the young master contributes to the stories are other maesters who had written about such lands in their own works. Similar to Longstrider, one of the first people to have sailed the Thousand Islands and to visit the N’Ghai was Corlys Velaryon. In addition to his travels toward the east, he tried and failed to find a northern route around Westeros, as many people have attempted, possibly to make trade routes easier, to to see if it was possible14. In this sense he is very much like Christopher Columbus, who set out from Spain in 1492 to find a faster route to India for trading. Unlike, Columbus he did not find a new land on that voyage but did go on to visit the Thousand Islands. His works were not complied by him, but by a master during that period of time, much like some of the expeditions of the voyages by Columbus would have been written down by someone of the cloth. In the end, the chroniclers and travellers of the Middle Ages, both real and imaginary, are echoed in A World of Ice and Fire with the similar stories and experiences in these new lands and peoples that are encountered. Regardless of when and what world you are talking about, the same question can pop up with few people who hear these stories, and that is whether there is “any truth to these grim fables brought back”15 from the travellers. Through all the travels and the stories, it does not change the fact that although these journey’s help expand the known world, and gave us detail into the unknown, there are still “frequent blank spaces where [there is] no knowledge”16. This lack of knowledge made it hard to determine the truth of the adventures both spoken orally and written down in both the Middle Ages and in the various societies that populate the overall world in the A Song of Ice and Fire series, proving that although we have maps, both they and the stories they contain “have their limits”16 as to what is truly known in the known world. 1 Kline, Naomi Reed. 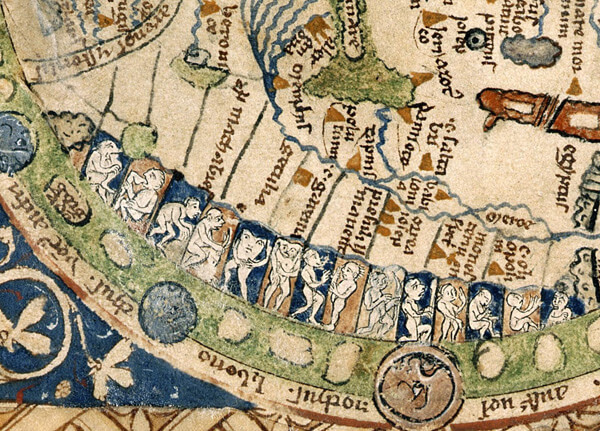 Maps of Medieval Thought: the Hereford Paradigm. (Woodbridge: The Boydell Press, 2001), 146. 2 Howard, Donald Roy. Writers and Pilgrims: Medieval Pilgrimmage Narratives and their Prosperity. (Los Angeles: University of California Press, 1980), 24. 3 Howard, Writers and Pilgrims: Medieval Pilgrimage Narratives and their Prosperity, 24. 4 Antonsson, Garcia Jr and Martin. The World of Ice and Fire, 252. 5 Antonsson, Garcia Jr and Martin. The World of Ice and Fire, 294. 6 “The Known World”. Game of Thrones Wiki. April 12, 2012. 7 Antonsson, Garcia Jr and Martin. The World of Ice and Fire, 252. 8 Antonsson, Garcia Jr and Martin. The World of Ice and Fire, 294-5. 9 Dutton, Paul. “Ratramnus and the Dog-Headed Humans” from Carolingian Civilization: A Reader. (University of Toronto Press, 2009), 1. 10 Elahi, Shirin. Here be dragons… exploring the ‘unknown unknowns’. (Postnomail Times, 2011) Abstract. 11 Kline, Maps of Medieval Thought: the Hereford Paradigm, 146. 12 Mandeville, John. The Travels of Sir John Mandeville. (New York: Macmillan Company, 1900), p. viii. 13 Antonsson, Garcia Jr and Martin. The World of Ice and Fire, 300. 14 “Corlys Velaryon”. 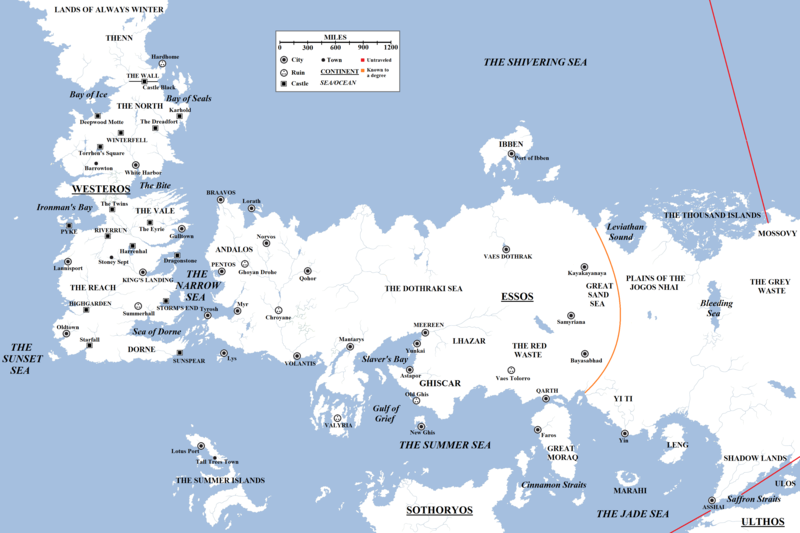 A World of Ice and Fire Wiki. March 6, 2015. 15 Antonsson, Garcia Jr and Martin. The World of Ice and Fire, 309. 16 Antonsson, Garcia Jr and Martin. The World of Ice and Fire, 277. “Corlys Velaryon”. A World of Ice and Fire Wiki. March 6, 2015. A Reader. University of Toronto Press, 2009. Elahi, Shirin. Here be dragons… exploring the ‘unknown unknowns’. Prosperity. Los Angeles: University of California Press, 1980. “Lomas Longstrider”. Game of Thrones Wiki. March 20, 2015. Mandeville, John. The Travels of Sir John Mandeville. New York: Macmillan Company, 1900. “The Known World”. Game of Thrones Wiki. April 12, 2012.